In recent remarks to the Senate Banking Committee, Federal Reserve Chairwoman Janet Yellen was her typical evasive and non committal self when the topic of interest rate hikes were broached. When the subject of potential oversight of the Fed came up, however, Ms. Yellen became quite forthright in her response. Senate Banking Chairman, Richard Shelby (R., Ala.) countered the Chairwoman saying “there is an even greater need for additional oversight” of the Fed since the onset of the financial crisis in 2007. Ms. Yellen, her predecessors, and every other Fed apologist are simply wrong when they assert that the central bank is an independent agency that is free of political influence. The Federal Reserve System was created by an act of Congress (1913) and can ultimately be “reformed,” altered, and or abolished by Congressional fiat if so desired. That Congress does not oversee Fed policy is a result of its charter, which was originally crafted by the Big Banksters of the time (mostly the Rockefellers and Morgans) in concert with their bought for and paid politicians. The lack of oversight was a deliberate part of their plan to give bankers and financers free reign to conduct monetary policy for their own benefit. The Federal Reserve is and has always been a political creature designed for the benefit of financial elites. It is a highly privileged cartel with monopoly control of the nation’s money supply. Unlike the propaganda which emits from Fed officials, the central bank was instituted to protect banksters from financial collapse and bank runs. Fine tuning the economy, reducing unemployment, or fighting inflation are all ancillary concerns for the Fed. These are the simple facts which are deliberately kept from the public at large by the political establishment, academia and the media. The Audit the Fed movement, which began in earnest with Ron Paul’s first presidential run, is a wrongheaded approach to solve the nation’s ongoing financial crisis. Senator Rand Paul’s bill is mostly grandstanding to bolster his status among the Republican Party’s populist contingent in his anticipated race for the nomination. In fact, instead of meaningful reform, greater public oversight of the Fed would most likely lead to worse results. Every Congressman and Senator would be pressuring the central bank to fund their pet projects. Can one imagine what the growth rate of the money supply would be if 535 ravenous politicians had a say in the conduct monetary policy?! Those who want to reverse the nation’s economic malaise should seek the Federal Reserve’s abolition and advocate its replacement with a de-politicized monetary order free of central banking. Such a system would most likely be based on a commodity (gold and/or silver) where “money producers” are free to engage in the creation of the “best money” and banking services to satisfy customers’ needs. In such an order, banks would function as any other enterprise by profit and loss. If banks loan funds wisely, they will succeed; if not, they will fail and go out of business replaced in the marketplace by more savvy entrepreneurs. There will be no bailouts at taxpayers’ expense for reckless financial speculation. Money and banking would become a sound and honest undertaking. To actually believe that an Audit the Fed initiative would become law is beyond naïve. The political establishment will never voluntarily relinquish or allow any legitimate oversight of one of its chief pillars of power. Instead of seeking change via politics, reformers must first change the climate of public opinion which can only be accomplished when the prevailing ideology is debunked. Until the Federal Reserve is seen as an engine of inflation and the creator of economic disorder which needs to be eradicated, America’s financial woes will, unfortunately, continue. * Jon Hilsenrath, “Yellen Puts Fed on Path to Lift Rates,” The Wall Street Journal, Wednesday, 25February 2015, A1, A2. This entry was posted in Uncategorized and tagged Central Banking, Federal Reserve on March 8, 2015 by antoniusaquinas. Abolishing the Fed is a wonderful idea! When and where do we begin? AMEN. I think Alexander Hamilton or Ben Franklin warned against having a central ‘bank’ for America. Abolish it! What a mess!!!! I agree with Anonius Aquinas, Don’t audit the Fed, abolish it!! The FED. has been the POWER BROKER behind OUR political system, Republicans & Democrats etc., providing abusive spending upon which professional politicians devise their deficit spending budgets that we the people of these continental Unites States have become desensitized by a state of everlasting amnesia in my opinion regards what the FED. is accomplishing yearly, by operating in conjunction with accommodating overspending politicians from every stripe upon which their paychecks are drawn (whatever amounts each receives that is….anybody know for sure?) which increases the overall National Debt liabilities of each citizen. Therefore, unemployment for example in the US is a harsh threat to the FED. depending upon middle class working Americans to pay all the bills plus the interest paid towards the FED. so we can supposedly reduce OUR deficit spending bills but that is mathematically impossible to accomplish. When the FED. provides the money for overspending, they have to create additional funds, in order to cover the present interest payments due but then there’s yet another interest payment due bill created at the same time in the name of working taxpayers predestined to be liable for all those payments but the payments are always and forever out of reach of US Middle Class workers range to pay and so the National Debt is pre-ordained to continue add infinitum without respite allowed or recognized by the FED. or OUR National Government. Obama is merely extrapolating taxpayers’ payment liabilities towards the FED., by appealing to we the people over and over again to spend on innumerable socialized programs such as funding immigration etc., etc., etc. Isn’t it OK to bring it up to your immediate family members that you should buy a new car etc. but what stops you is your present budget isn’t it? If the new car is a great idea but unaffordable under the rules of your budget, maybe repairs to your old care are more in order but, via Obama’s & others’ inflationary policies, paying to have OUR cars worked on today costs a lot more money then it use to for both shop time and the parts required to keep US on the road going to work etc. The FED. & OUR National Government both know that, if the FED. were to be abolished which it should, and we the people were to be imbued with true economic powers via Article 1; Section 10 of OUR US Constitution calling for gold and silver coins only, this would upset the entire economic capacities for a time of adjustment not just in the US but throughout the entire world and so they constantly harp on that theme they call deflation as though it was some kind of impossible disease to be eradicated instead of a Constitutional edict to be obeyed regardless of present economic circumstances. Someone said that that would create a huge shortage of money and place all economic activities both domestic and foreign in danger of depression, because they said to me that such a precious metals standard wouldn’t work to keep economic activities alive and thriving, due to there not being enough of those metals worldwide. However, we are all now today are we not prone to remember back when OUR economies were more robust and thriving accomplishments and, from December 1944 to August 1971 the US operated on a gold standard with the $ being the premier currency of the entire world because it was redeemable in gold at the US Treasury or any Federal Reserve Bank at $35 per troy oz. Today, we are using an all out paper and ink monetary system plus trillions of added digital funds spread out throughout the banking system and corporate structures etc. Profits are measured today in fiat profits which always carries a degree of risk that real specie gold and silver do not carry and so we have chosen to follow the lead of the FED. and OUR professional politicians into the land of irredeemable money and debt that allows them to forever extract buying powers from OUR US $ via inflationary policies designed to pay their political bills which, if they are unable to pay for everything, they ask the FED.to accommodate their over spending which is handed down to we the people tax payers to pay the price of paying for overspending plus the prices added when we shop due to the inflation it takes to keep the system moving away from the deflationary policies about which OUR government and the FED. constantly harp, in order to continue taxpayers’ compliance with their inflationary policies add infinitum. In my personal eyes, the only and final way out of this inordinate dilemma of irredeemable monetary debt policies is to totally repudiate the US $ which will automatically kill the FED. and OUR governments’ annual overspending habits appetite, in order to embrace what we were asked to embrace by OUR Forefathers’ use of their forethoughtfulness; when they placed Article 1; Sections 10 within OUR U S Constitution mandating that we the people taxpayers use only specie gold and silver coins within OUR economic system, in order to automatically throttle over reaching government spending through Mother Nature’s limited supplies of naturally occurring money which a lot of very harsh monetary history has proven over and over again are gold and silver money (not currency which can be paper based or digital etc.) “ONLY”! Dear reader you are invited to please, for the sake of the possibilities of re-establishing OUR REPUBLIC, read Article 1; Section 10 of OUR US Constitution yourself and see what you think it means to you and the future of these United States Of America which was designed as a REPUBLIC not a DEMOCRACY such as OUR professional politicians practice today in or out of political office. If these Constitutional issues are allowed to continue to evolve, in my humbled opinion the outcome is NOT in the hands of OUR professional political rulers but in the hands of we the people; for after all we have the #1: ultimate power in the marketplace do we not to choose if we want Constitutional specie value gold and silver money limited by Mother Nature which by natural law limits all types of spending or #2: unlimited, irredeemable paper/digital debt notes upon which we are stuck with both the principal and interest debt repayments forever and ever? #2 has been the trend now for more than 100 years sense the FED. was introduced to oversee OUR economy but which has turned OUR economy into a debtors’ economy rather than a debt FREE market place FREE from the overburdens of endless debts which is killing OUR individual/collective spirits and thereby killing OUR Country by establishing a beach head of greed being enjoyed by the Bankers who rule over US with their policies rather than the thoughtful policies that should be overwhelmingly regarded inside OUR Constitution which calls for gold and silver coins only in Article 1; Section 10. When President Nixon closed the US Gold Window on August 15, 1971, whether you know it or not dear reader, he at that moment in time declared the United States as being bankrupt throughout the world but sense then on top of the bankruptcy President Nixon declared on that memorial date, we have added trillions upon trillions of debt to that declaration of bankruptcy all owed to the FED. plus interest which we can NEVER accomplish paying forever but is that what we the people truly desire? If the system of debt slavery is to ever end, it IS upon the shoulders of we the people to accomplish that reform and get OUR US back into the hands of we the people taxpayers under Constitutional instead of political/FED. management!!! In the meantime business desires to continue as usual but weighing profits in terms of depreciating fiat, irredeemable paper money can NEVER work in OUR favor can it? Here is what Daniel Webster of dictionary fame had to say about the monetary trap into which we have allowed ourselves to be placed whether we are employers or employees: “Of all the contrivances ever designed for cheating the laboring classes (Middle Class) of mankind, none has prove to be more successful than that which deludes them with issues of irredeemable, I Owe You Nothing, fiat paper money!” If that’s how we want OUR US economy run then we need do nothing but, if on the other hand we want to get back to OUR Constitutional moorings, we will have to repudiate the STATE’s phony, counterfeit, irredeemable paper money on OUR way back to specie gold and silver safe savings money decided upon by OUR US Constitution!! I believe “Audit the Fed” is intended as a first step. It is an evidence gathering step. It is not practical to advocate “Abolish the Fed,” when you can’t prove what they have done wrong. Once all the shady deals are known, due to the audit, it will be much more likely that “Abolish the Fed” will gain traction. BS…. 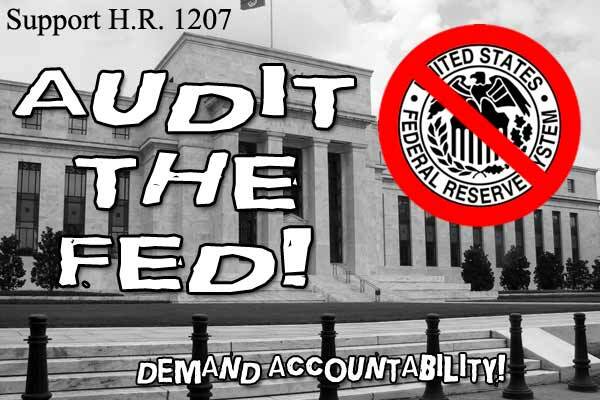 AUDIT THE FED!!! That way we will know how many trillions have been stolen. Send the thieves in for “life without parole”, then make changes you desire. But first, put the thieves in prison!!! It might as well be abolished, the paper of a one dollar bill is the same as a hundred. The dollar has been so over inflated that it’s true worth is 3 cents. That isn’t even the pennies of today. If you really want to see what the new pennies are made out of, go to YouTube and look up the Crazy Russian Hacker. And no he’s not the type of hacker to mess your computer up. He does experiments, one of wich he files just enough to show the zinc on the inside, submerses it into a type of acid. It eats all the zinc the amount of copper left is wafer thin. We need to go back to a currency that is backed by gold and silver, just like the old days. We need to get into Fort Knox, I want to see what we have in our reserves. I have heard something that if it’s true, the United States will become China. What I read about this is that China owns most of our debts, I have read things online. Basically, well not basically it flat out says that Mr. Obama has given China eminent domain. Which means we can’t pay you take our land. Reading that really pissed me off. I am hoping that it’s not true, but it wouldn’t surprise me if it is. Return to the Gold Standard. Only tin-horned Dictators like Obama print ‘Money’ until there is no tomorrow. Pingback: Federal Reserve Oversight Is Useless. Abolish the Fed!